Shooting 68.4 percent from the field and featuring eight players in double-digit scoring, the 2014 USA Basketball Women’s U18 National Team (2-0) ran away with a 118-50 win against El Salvador (0-2) in the 2014 FIBA Americas U18 Championship on Thursday night at the U.S. Olympic Training Center in Colorado Springs, Colorado. 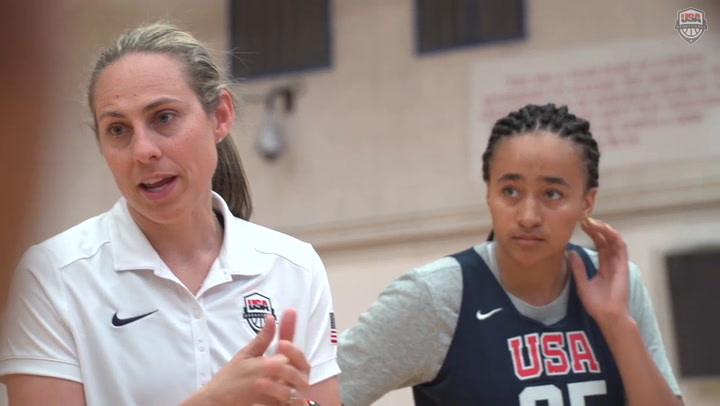 “I felt we were ready to go,” said USA head coach Dawn Staley (University of South Carolina). “I felt we used our length to our advantage. The players who started the game got us out to a big lead, and then we pretty much cruised the rest of the way. Sinking 4-of-4 from 3-point, Destinee Walker (Lake Highland Prep School/ Ocoee, Fla.) was the USA’s highest scorer with 18 points; followed by 17 points from Jessica Shepard (Fremont H.S./Fremont, Neb. ); 16 points and eight rebounds from A’ja Wilson (Heathwood Hall H.S./ Hopkins, S.C.); 12 points and 12 rebounds from Napheesa Collier (Incarnate Word Academy/O’Fallon, Mo. ); 12 points and four assists from Marina Mabrey (Manasquan H.S./Manasquan, N.J.); 11 points from Ariel Atkins (Duncanville H.S./Duncanville, Texas); and 10 points apiece from Beatrice Mompremier (Miami H.S./Miami, Fla.) and Brianna Turner (Manvel H.S/Pearland, Texas). 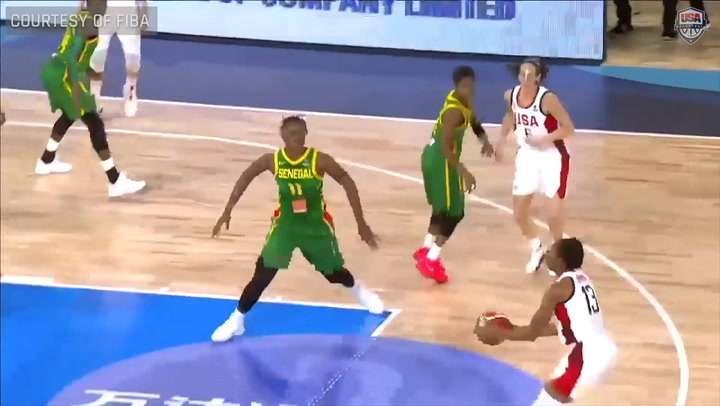 The USA recorded 30 assists on its 52 made baskets, and won the rebounding battle 42-16. El Salvador led in the first minute of the game 5-2, but from there it was all USA. The USA’s largest run of the game, a 20-0 spurt from 8:48 to 4:58, put the North Americans up 22-5. El Salvador made a basket from the field to stop the spurt, and the first quarter ended with the USA leading 33-11. 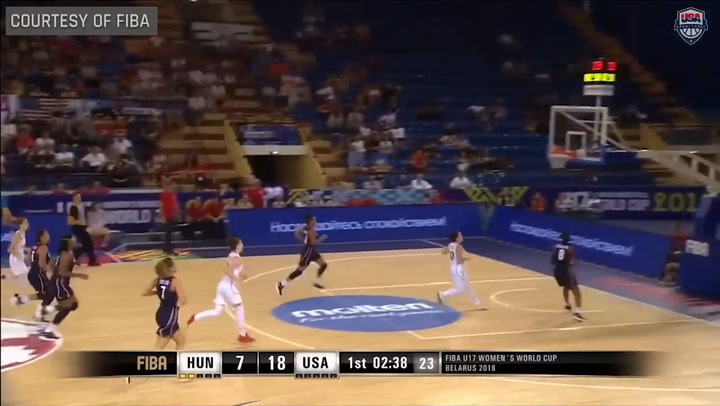 Nine U.S. players put points on the board in the second quarter, led by seven from Walker. The USA compiled 34 points while allowing El Salvador just 11, and the score was 67-22 at halftime. At the midway point, 11 of 12 U.S. players already had scored points in the game. Recording its highest-scoring period of the tournament thus far, the USA tallied 38 points in the third quarter and reached triple digits on the scoreboard with 37 seconds left, when Walker hit the first of back-to-back 3-pointers to help the USA end the quarter leading 105-29. The USA actually cooled off in the fourth period – it had been shooting 76.7 percent through the first 30 minutes. El Salvador found space from deep late in the game, and Astrid Heredia, who finished with 16 points, made four 3-pointers in the last 10 minutes to help put up 21 points to the USA’s 13 to bring the game to its 118-50 final. El Salvador was led by Hillary Martinez, who finished with 17 points. Also today, in Group B, Brazil (1-1) edged out Argentina (1-1) 61-56, and Chile (1-1) beat Puerto Rico (1-1) 63-51; while in the USA’s Group A, Canada (1-0) defeated Mexico (0-1) 81-54. 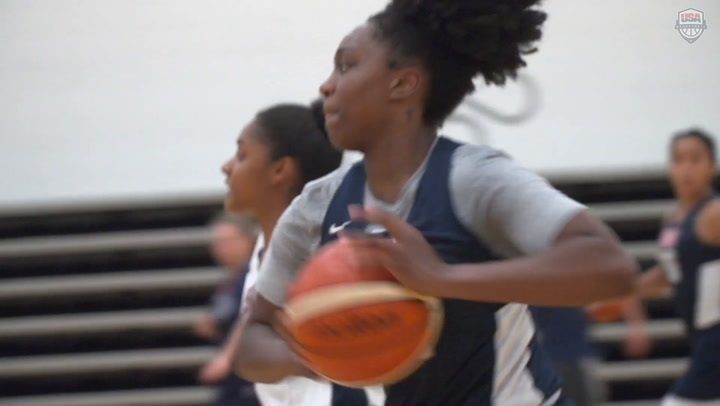 The USA will wrap up its preliminary round against Canada at 5:30 p.m. (MDT) on Aug. 8. Admission to the 2014 FIBA Americas U18 Championship is free, and all games will take place in Sports Center I at the U.S. Olympic Training Center. Following the preliminary round, the top two finishing teams from each group will meet in the semifinals on Aug. 9, with the winners meeting in the gold medal game on Aug. 10. The third and fourth-placed teams after the preliminary round will compete for fifth through eighth places, including consolation semifinals on Aug. 9 and classification games on Aug. 10. The top four finishing teams will qualify for next summer’s 2015 FIBA U19 World Championship. The USA is looking for a seventh-straight gold medal at the 2014 FIBA Americas U18 Championship for Women, and is now 45-2 over all in the event since it was first held in 1988.